As you can tell from these pictures (sorry they aren't very good, my half bath is pretty small so they were hard to take), I haven't done much, well anything to decorate this bathroom. I have some ideas, but I need your expert opinion. I'd like to do something fun with zebra print in this bathroom. But, I'm having a hard time figuring out what other color to put w/ the black and white- green, hot pink, yellow, blue??? So, can you help me with that and also, paint color, accessories, wall decor, etc. Whatever you think would make this bathroom look AWESOME! 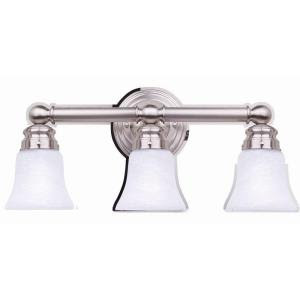 Do I need to have this bathroom coordinate with my family room decor at all, since it's off the FR? or can it just be it's own thing? To answer Jennie's question about her half bath coordinating with her Family Room - One rule of thumb that I stick by, especially in all the main areas, is that you want everything to flow. For example, you don't want your family room to be bright pink and avocado green and then to have a kitchen next to it that is red and blue. That would just hurt your eyes! MASS CONFUSION!! So, for example, if you LOVE red then make sure that you have a little red throughout all your main areas. Have that be the thing that ties your home together. Maybe you have a red wall in your kitchen, and then in the family room you have some drapes and/or throw pillows with red in the fabric, or even a little vase on an end table. This same rule applies to the half bathroom...you still want it to flow. So, in my example, you would want to add a little red into the mix!! I really like the black and white combination...you can put any color imaginable with it and it will look amazing. After talking with Jennie...I would go with green as the main color and accent it with the black and white. This is the color scheme we are going with. If you are not sure what color scheme you want to go with...a great source is colour lovers. You can mess around with every color imaginable and put your own color palette together. A simple and inexpensive add would be hardware for your cabinets...they range between $2-$5 at Home Depot. I would go with black ones...to go with your accent color. 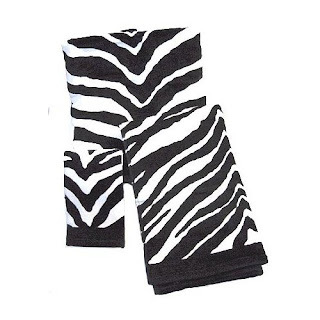 I love these towels from amazon.com for only $31.99...you have the zebra print Jennie is wanting and it isn't over the top and in your face. As for behind the toilet, I would look for a piece that has your color scheme in it. It could be something for on top of the toilet, like a like piece of pottery and then some greenery in it. You could also find some artwork that you love and hang it on the wall. Some great place to go for this stuff is Hobby Lobby, of course, or Ross, TJ Maax, etc... ALSO...don't make things too matchy, matchy...if there is red in the piece you love...GET IT! Another simple fix that can either be expensive or incredibly cheap is to change out the mirror. 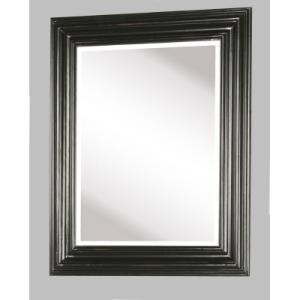 Most builders put in a regular mirror...with no molding. You can find mirrors everywhere! 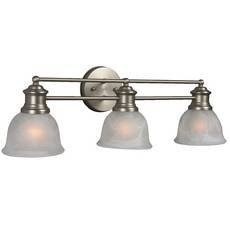 I love this one from Home Depot (it is $188)...it would add some great dimension to your bathroom...and a little black:) You can also find some great mirrors at garage sales for next to nothing. If you are lucky and find one that is the perfect size, but the molding doesn't match - just spray paint the molding black...(again, spray paint is your friend...I use it for everything!) I see mirrors all the time for super cheap!! Another option you can do is to put a black and white rug under the sink...I see them everywhere! One last little tidbit to remember when re-doing your bathrooms (maybe not for Jennie since she has a brand new home) - you might as well go the extra mile and clean your grout and make it look brand new! All you need to do is pour some vinegar on it...yes, the kind you put in salad dressings and is probably in your pantry. Get a brush, use some elbow grease and scrub it clean! Works like magic! Jennie, I hope that this helped you a little bit and that you will share pictures of the final product! Thanks for your help. You gave me some great ideas of things I never thought of. You are AWESOME, as always! ooo i know you should make your house flow, call me dumb but you just put it into words that make so much sense! I think i want yellow in all my rooms and now i know how to do it.